No time for a game on the Golf Course? Why not play in your own backyard. 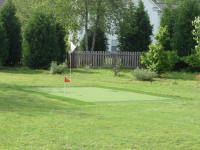 Have your own putting green installed. With a simple installation of concrete, asphalt or crushed stone and a synthetic turf surface, you can have the pleasures of your own putting green.